BBC sitcom-writer James Cary offers a wry look at jokes, how they work and what happens when jokes go terribly wrong. Interested in how humour works? Every few weeks a politician, pundit or soap star causes a media storm by making a gaffe or tweeting a joke that some people do not find funny. Comedy is very hard to get right and yet we think it's important to have a sense of humour and not take yourself too seriously. On the other hand, a sense of humour failure can lead to losing your friends, your twitter account, your job, your career and, in some cases, your life. James Cary knows about this. He is a sitcom writer who's written jokes about bomb disposal in Afghanistan (Bluestone 42), defended comments about Islam by Ben Elton on Newsnight, been on a panel with radical Muslim cleric Anjem Choudary, sits on the General Synod of the Church of England and somehow managed to co-write episodes of Miranda. An odd mix, but one that makes him very readable. This entertaining, breezy book, explains how comedy works (with jokes and quotes) and gives much-needed insights into the controversy surrounding humour. 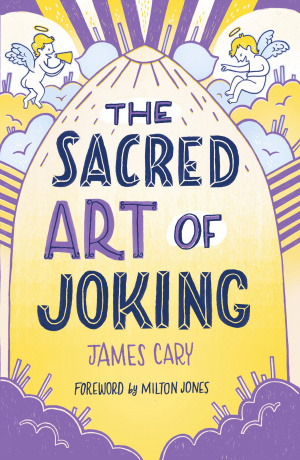 Sacred Art of Joking by James Cary was published by SPCK in January 2019 and is our 1973rd best seller. The ISBN for Sacred Art of Joking is 9780281080922. Be the first to review Sacred Art of Joking! Take a peek at some articles related to Sacred Art of Joking. Got a question? No problem! Just click here to ask us about Sacred Art of Joking. 11. Do Christians have a sense of humour? 19. Why don't comedians make jokes about Islam? 28. What's so funny about Easter? James Cary is a BBC sitcom-writer (Miranda, Bluestone 42, Another Case of Milton Jones) and theologian. He’s also a member of the General Synod for the Church of England, and has spent a lot of his life watching jokes (some of them his own) go horribly wrong. He runs a touring theatre company and performs. He has just produced a 64-date tour of the UK of a show about Martin Luther and 95 Theses, called A Monk’s Tale, which ran for two weeks at the Edinburgh Fringe. There are very likely to be future, perhaps even bigger, tours in 2018-9. James is married, with two children and lives in Somerset.